Send free SMS to mobile phones now. There are many free services available on Internet that enable users to send free SMS to mobile and free SMS to India specifically. However, if you google it, you will many websites, which promises to send free SMS. But when you send it, it reaches nowhere unfortunately. So, beware of these fraud SMS websites as they can misuse your mobile number. Way2SMS is a popular website, which provides the facility to send free text messages. You can send free SMS to almost all the major carriers in India. However, it restricts the number of SMS a user can send in a day. The best feature of way2sms.com is its fast delivery speed. Where most of other free sms sending websites do not ensure speedy delivery, way2sms ensures lightening fast delivery of your text message. 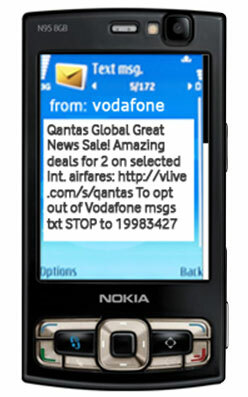 The other very popular and effective service to send free sms to mobile phones is 160by2.com. 160by2 allows YOU to send Free SMS up to 80 characters long. 160by2 free sms service says that it allows each user to send up to 500 free text messages per day. However, one can send only 100 messages to one particular number in a day. If you guys know about some more free sms services, please comment here and let me know. Till them, send free sms to India and enjoy!